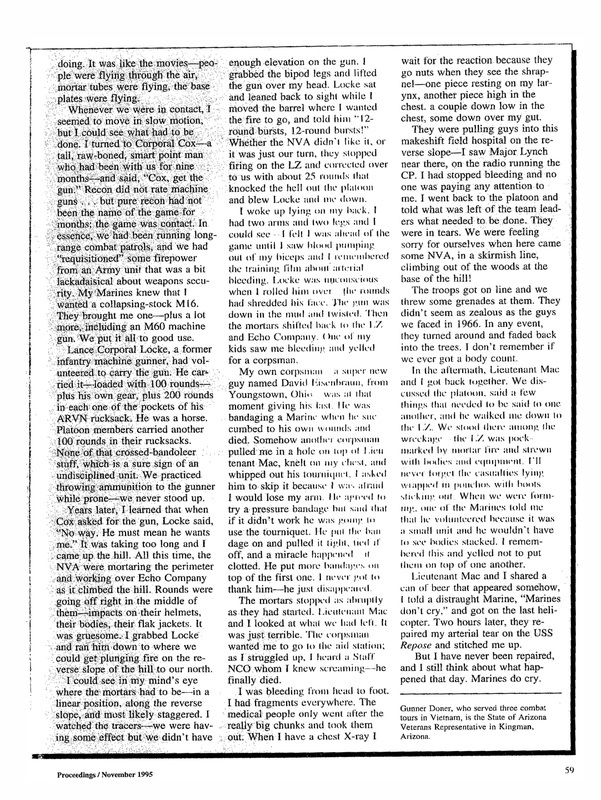 Below you will find Jarvis D. Lynch's article about LZ Margo, an operation conducted by 2/26 in Vietnam. Lynch is a retired USMC Major General who lives in Tampa, Florida and was the Operations officer of 2/26 during the operation at LZ Margo. He was the featured speaker at the 5th Marine Division Association's 65th reunion. 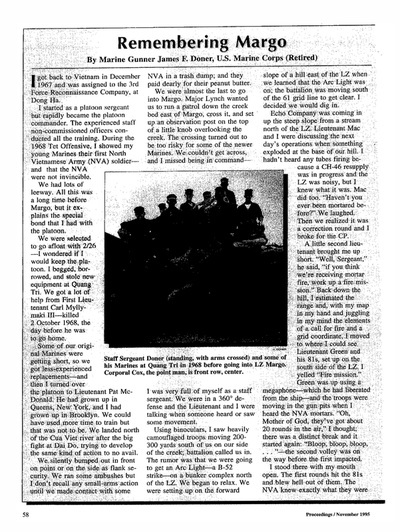 “They were typical grunts and Corpsmen-normally unwashed, usually underfed, always overloaded and more often than not, tired...“ A battalion operations officer reflects on one day in a very long war. The 2d Battalion, 26th Marines rarely appears in the Marine Corps illustrious combat history. The battalion saw only brief service during World War II … long enough to land in the assault wave at Iwo Jima. Later, during the Vietnam War, it reappeared for a few years before its colors once again were returned to the museum curators. It’s daily Vietnam experience was usually far less stressful than the Iwo Jima operation but Vietnam had its days and when it did, the late 1960s Marine of 2/26 experienced the horrors of war at the same levels of intensity faced by the generation that fought its way up the black ash terraces beneath Mount Suribachi. This is the story of one of those days: 16 September 1968. Late 1968 found the 3d Marine Division serving in the extreme north of I Corps, the northern most corps area in what was then the Republic of Vietnam, controlling ten infantry battalions: those of its organic 3d, 4th, and 9th Marine Regiments, plus 2/26. The division’s operational concept — an effective one — was as easy to understand as it was difficult to execute. Relying on few fixed defensive positions and even fewer infantry units to defend them, the defense was offense. Battalions stayed in the bush for weeks on end covering North Vietnamese Army (NVA) infiltration routes and, in general, looking for trouble. They moved constantly, on foot or by helicopter, and when they encountered an NVA unit, all hell broke lose until it was destroyed. Our battalion – I was the operations officer – celebrated the Fourth of July in an area near the coast called Leatherneck Square, where it was responsible for defending the square’s northern and western sides. In late July, the battalion was reinforced to conduct amphibious assault operations and designated Battalion Landing Team (BLT) 2/26. After training with the reinforcements, BLT 2/26 embarked in the ships of Amphibious Ready Group Alfa, including the famous World War II Essex – class carrier Princeton (LPH-5), now an amphibious assault ship. Initially, there was talk of landings just south of the Ben Hai river inside the Demilitarized Zone (DMZ), but the pattern of NVA operations had shifted westward and the amphibious talk died out. An early September landing, well inland, marked a temporary end to our amphibious experience, and the beginning of service as one of the division’s maneuver battalions. Despite the change in mission, the battalion kept its reinforcements – among them, a tank platoon, a 105mm artillery battery, and a 4.2 inch mortar battery. Operational control shifted to the 3d Marines, head quartered at Camp Carroll, but several days of aggressive patrolling yielded no enemy contacts. 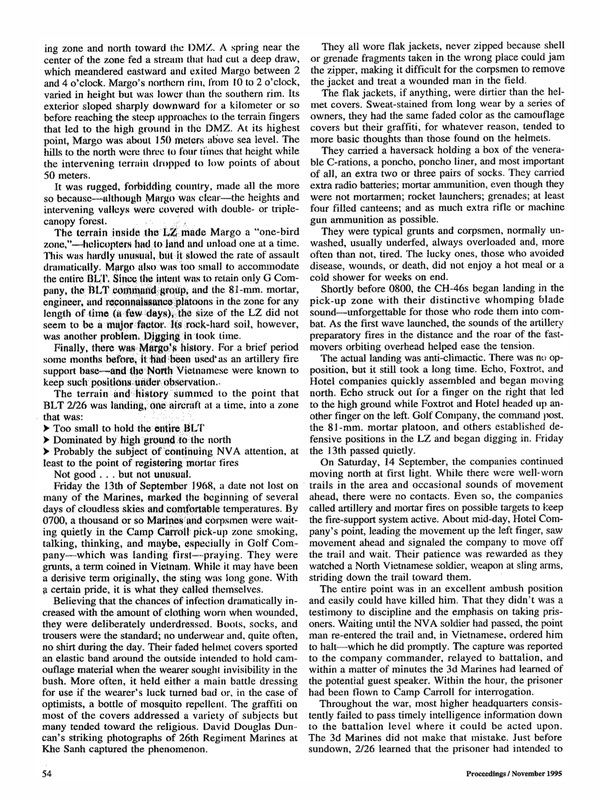 About 7 September, the BLT’s field elements were trucked to Camp Carroll and staged for two contingencies: a helicopter assault into Landing Zone (LZ) Margo, a barren hilltop just south of the DMZ, roughly 17 kilometers west-northwest of Camp Carroll — or a shift of operational control to the 4th Marines and a return to Khe Sanh, where the battalion had served throughout the early 1968 siege. To the relief of those who had served at Khe Sanh, the Margo operation prevailed – an assault into the LZ followed by movement north to the high ground on the southern border of the DMZ, where the battalion was to turn east, and sweep the high ground. The orders emphasized the need to take prisoners. A typhoon brushed the coast and although the tree covered mountains inland showed no outward sign of the rains, movement became impossible. The war ground to a halt. Finally the weather began clearing and, on 12 September the commanding officer of the supporting helicopter squadron flew in for the Zippo brief — a planning and co-ordination meeting attended by the battalion and squadron commanders plus their staffs. Zippos were business like affairs. Lives were at a stake and the assaulting battalion and supporting squadron had to reach complete agreement and understanding. On the plus side, Margo was easy to find because of its location on the north side of the Cam Lo River inside a distinctive kilometer-wide, and more than a kilometer deep – U-shaped bend.Unfortunately this plus was offset by several minuses — most of which stemmed from the tiresome but necessary subject of terrain. Margo, which resembled a broken bowl, was smaller than the maps indicated. 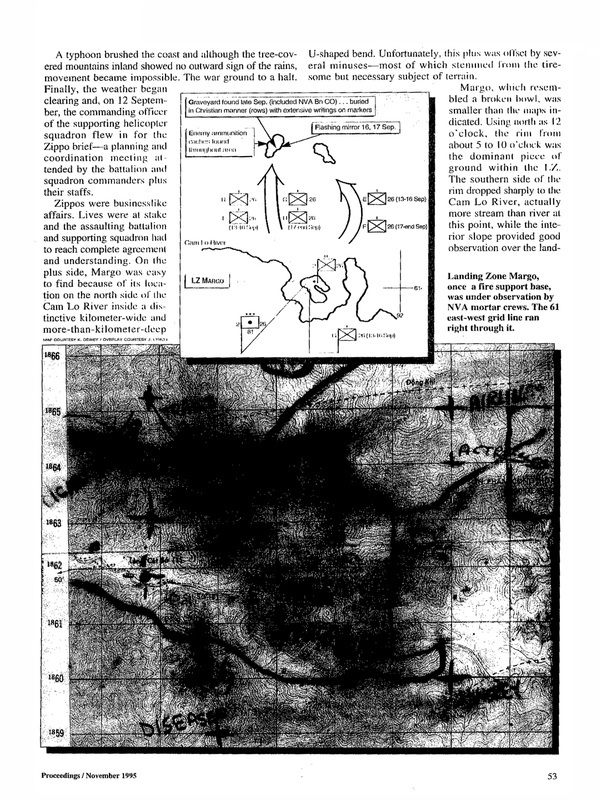 Using north as 12 o’clock, the rim from about 5 to 10 o’clock was the dominant piece of ground within the LZ. The southern side of the rim dropped sharply to the Cam Lo River, actually more stream than river at this point. While the interior slope provided good observation over the landing zone and north toward the DMZ. A spring near the center of the zone fed a stream that had cut a deep draw, which meandered eastward and exited Margo between 2 and 4 o’clock. 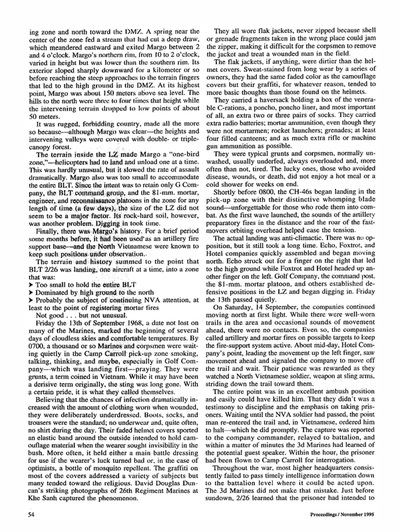 Margo’s northern rim, from 10 to 2 o’clock, varied in height but was lower than the southern rim. Its exterior sloped sharply downward for a kilometer or so before reaching the steep approaches to the terrain fingers that led to the high ground in the DMZ. At its highest point, Margo was about 150 meters above sea level. The hills to the north were three to four times that height while the intervening terrain dropped to low points of about 50 meters. It was rugged, forbidding country, made all the more so because — although Margo was clear — the heights and intervening valleys were covered with double — or triple canopy forest. The terrain inside the LZ made Margo a “one-bird zone,” — helicopters had to land and unload one at a time. This was hardly unusual, but it slowed the rate of assault dramatically. Margo also was too small to accommodate the entire BLT. Since the intent was to retain only G Company, the BLT command group, and the 81mm mortar, Engineer, and Reconnaissance platoons in the zone for any length of time (a few days), the size of the LZ did not seem to be a major factor. Its rock hard soil, however, was another problem. Digging-in, took time. ​Not good … but not unusual. 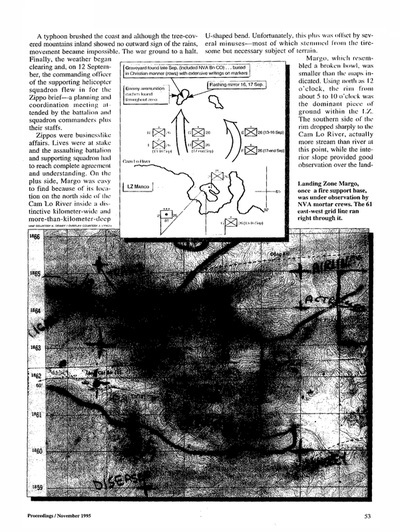 Friday the 13th of September 1968, a date not lost on many of the Marines, marked the beginning of several days of cloudless skies and comfortable temperatures. 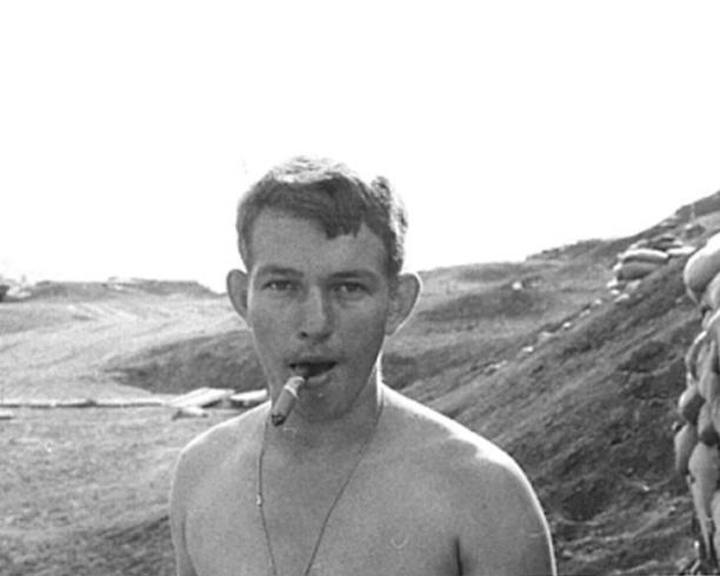 By 0700, a thousand or so Marines and Corpsman were waiting quietly in the Camp Carroll pick-up zone smoking, talking, thinking, and maybe, especially in Golf Company – which was landing first – praying. They were grunts, a term coined in Vietnam. While it may have been a derisive term originally, the sting was long gone. With certain pride, it is what they called themselves. Believing that the chances of infection dramatically increased with the amount of clothing worn when wounded, they were deliberately underdressed. Boots. socks, and trousers were the standard; no underwear and, quite often. no shirt during the day. Their faded helmet covers sported an elastic band around the outside intended to hold camouflage material when the wearer sought invisibility in the bush. More often, it held either a main battle dressing for use if the wearer’s luck turned bad or, in the case of optimists, a bottle of mosquito repellent. The graffiti on most of the covers addressed a variety of subjects but many tended toward the religious. David Douglas Duncan’s striking photographs of 26th Regiment Marines at Khe Sanh captured the phenomenon. 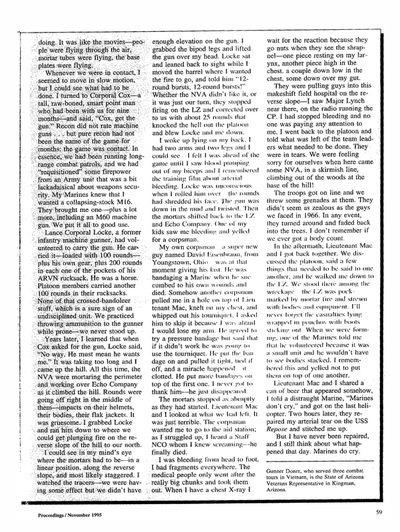 They all wore flak jackets, never zipped because shell or grenade fragments taken in the wrong place could jam the zipper, making it difficult for the Corpsmen to remove the jacket and treat a wounded man in the field. The flak jackets, if anything, were dirtier than the helmet covers. Sweat-stained from long wear by a series of owners, they had the same faded color as the camouflage covers but their graffiti, for whatever reason, tended to more basic thoughts than those found on the helmets. They carried a haversack holding a box of the venerable C-rations, a poncho, poncho liner, and most important of all, an extra two or three pairs of socks. They carried extra radio batteries; mortar ammunition, even though them were not mortar men; rocket launchers, -grenades; at least four filled canteens; and as much extra rifle or Machine gun ammunition as possible. They were typical grunts and Corpsmen, –normally unwashed, –usually underfed, always overloaded and, more often than not, tired. The lucky ones, those who avoided disease, wounds. or death, did not enjoy a hot meal or a cold shower for weeks on end. Shortly before 0800, the CH-46s began landing in the pick-up zone with their distinctive whomping blade sound-unforgettable for those who rode them into combat. As the first wave launched, the sounds of the artillery preparatory fires in the distance and the roar of the fast movers orbiting overhead helped ease the tension. The actual landing was anti-climactic. There was no opposition. but it still took a long, time. Echo, Foxtrot, and Hotel companies quickly assembled and began moving north. Echo struck out for a finger on the right that led to the high ground while Foxtrot and Hotel headed up another finger on the left. Golf Company, the command post, the 81-mm. mortar platoon. and others established defensive positions in the LZ and began digging in. Friday the 13th passed quietly. On Saturday, 14 September, the companies continued moving north at first light. While there were well-worn trails in the area and occasional sounds of movement ahead. there were no contacts. Even so, the companies called artillery and mortar fires on possible target to keep the fire-support system active. About mid-day, Hotel Company’s point, leading the movement up the left finger, saw movement ahead and signaled the company to move off the trail and wait. Their patience was rewarded as they watched a North Vietnamese soldier, weapon at sling arms, striding down the trail toward them. The entire point was in an excellent ambush position and easily could have killed him. That they didn’t was a testimony to discipline and the emphasis on taking prisoners. Waiting until the NVA soldier had passed. the point man re-entered the trail and, in Vietnamese. ordered him to halt — which he did promptly. 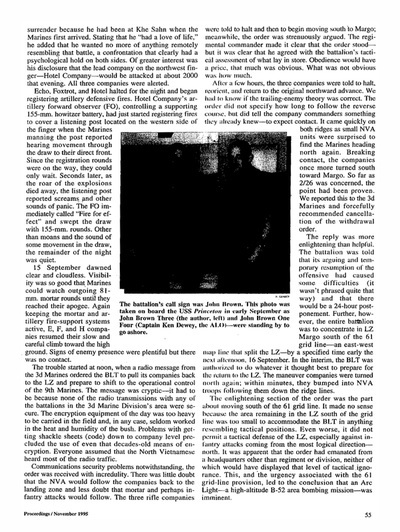 The capture was reported to the company commander, relayed to battalion. and within a matter of minutes the 3d Marines had learned of the potential guest speaker. Within the hour. the prisoner had been flown to Camp Carroll for interrogation. Throughout the war, most higher headquarters consistently failed to pass timely intelligence information down to the battalion level where it could be acted upon. The 3rd Marines did not make that mistake. Just before sundown. 2/26 learned that the prisoner had intended to surrender because he had been at Khe Sanh when the Marines first arrived. Stating that he “had a love of life.” he added that he wanted no more of anything remotely resembling that battle, a confrontation that clearly had a psychological hold on both sides. 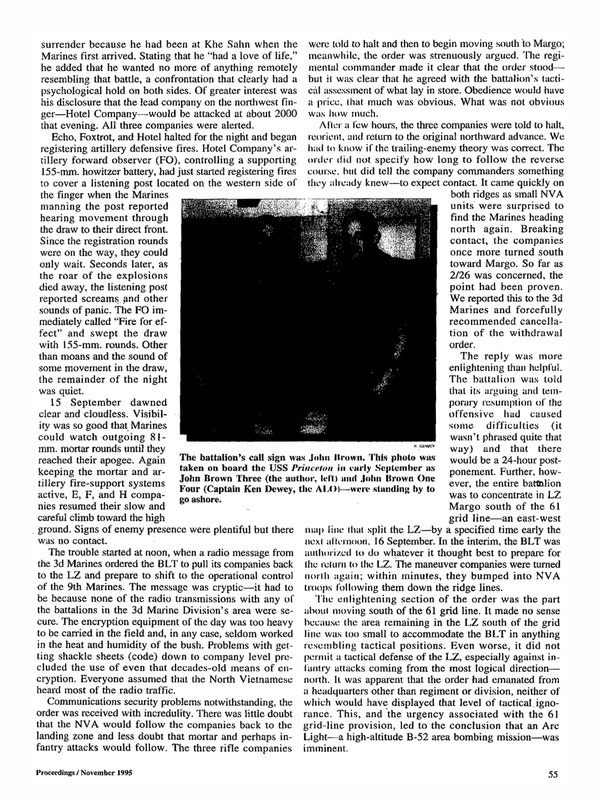 Of greater interest was his disclosure that the lead company on the northwest finger – Hotel Company – would be attacked at about 2000 that evening. All three companies were alerted. Echo, Foxtrot, and Hotel halted for the night and began registering artillery defensive fires. Hotel Company’s artillery forward observer (FO), controlling a supporting 155-mm. howitzer battery, had just started registering fires to cover a listening post located on the western side of the finger when the Marines manning the post reported hearing movement through the draw to their direct front. Since the registration rounds were on the way, they could only wait. Seconds later, as the roar of the explosions died away. the listening post reported screams and other sounds of panic. The FO immediately called “Fire for effect” and swept the draw with 155-mm. rounds. Other than moans and the sound of some movement in the draw the remainder of the nigh; was quiet. 15 September dawned clear and cloudless. 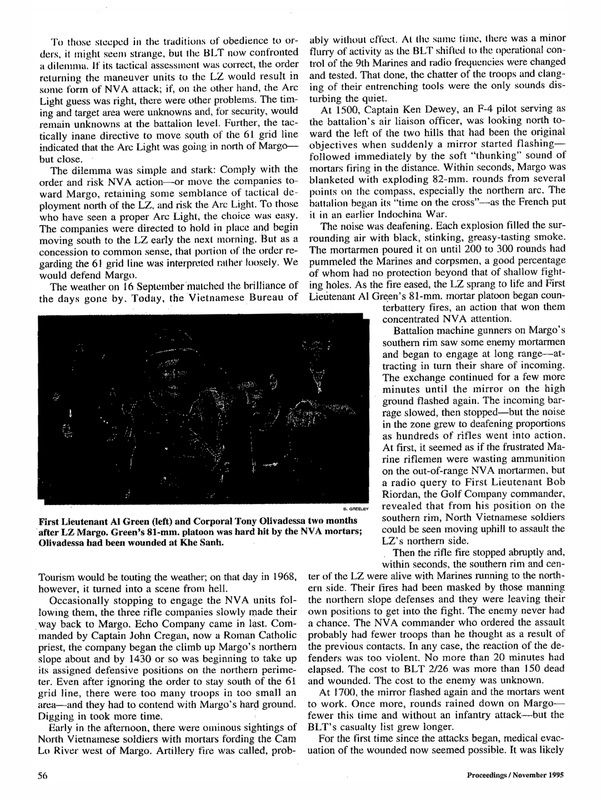 Visibility was so good that Marines could watch outgoing 81mm mortar rounds until they reached their apogee. Again keeping the mortar and artillery fire-support systems active. E F, and H companies resumed their slow and careful climb toward the high ground. Signs of enemy presence were plentiful but there was no contact. The trouble started at noon, when a radio message from the 3d Marines ordered the BLT to pull its companies back to the LZ and prepare to shift to the operational control of the 9th Marines. The message was cryptic — it had to be because none of the radio transmissions with any of the battalions in the 3d Marine Division’s area were secure. The encryption equipment of the day was too heavy to be carried in the field and, in any case, seldom worked in the heat and humidity of the bush. Problems with getting shackle sheets (code) down to company level precluded the use of even that decades old means of encryption. Everyone assumed that the North Vietnamese heard most of the radio traffic. Communications security problems notwithstanding. the order was received with incredulity. There was little doubt that the NVA would follow the companies back to the landing zone and less doubt that mortar and perhaps infantry attacks would follow. The three rifle companies were told to halt and then to begin moving south to Margo; meanwhile the order was strenuously argued. The regimental commander made it clear that the order stood but it was clear that he Agreed with the battalion’s tactical assessment of what lay in store. Obedience would have a price. that much was obvious. What was not obvious was how much. After a few hours. the three companies were told to halt, reorient. and return to the original northward advance. We had to know if the trailing-enemy theory was correct. The order did not specify how long to follow the reverse course. but did tell the company commanders something they already knew — to expect contact. 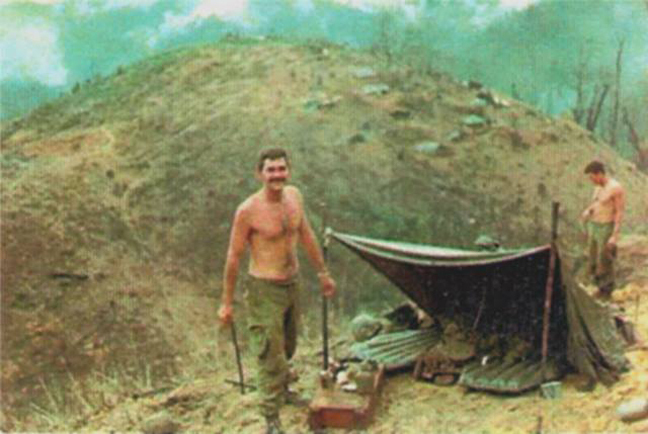 It came quickly on both ridges as small NVA units were surprised to find the Marines heading north again. Breaking contact, the companies once more turned south toward Margo. So far as 2/26 was concerned, the point had been proven. We reported this to the 3d Marines and forcefully recommended cancellation of the withdrawal order. The reply was more enlightening than helpful. The battalion was told that its arguing and temporary resumption of the offensive had caused some difficulties (it wasn’t phrased quite that way) and that there would be a 24 hour postponement. Further, however, the entire battalion was to concentrate in LZ Margo south of the 61 grid line — an east-west map line that split the LZ — by a specified time early the next afternoon. 16 September. In the interim, the BLT was authorized to do whatever it thought best to prepare for the return to the LZ. The maneuver companies were turned north again: within minutes. they bumped into NVA troops following them down the ridge lines. The enlightening section of the order was the part about moving south of the 61 grid line. It made no sense because the area remaining in the LZ south of the grid line was too small to accommodate the BLT in anything resembling tactical positions. Even worse, it did not permit a tactical defense of the LZ, especially against infantry attacks coming from the most logical direction — north. It was apparent that the order had emanated from a headquarters other than regiment or division, neither of which would have displayed that level of tactical ignorance. This. and the urgency associated with the 61 grid line provision, led to the conclusion that an Arc Light-a high altitude B-52 area bombing mission — was imminent. To those steeped in the traditions of obedience to orders it might seem strange, but the BLT now confronted a dilemma. If its tactical assessment was correct, the order returning the maneuver units to the LZ would result in some form of NVA attack; if,. on the other hand, the Arc Light guess was right, there were other problems. The timing and target area were unknowns and, for security, would remain unknowns at the battalion, level. Further, the tactically inane directive to move south of the 61 grid line indicated that the Arc Light was going in north of Margo but close. The dilemma was. simple and stark: Comply with the: order and risk NVA action — or move the companies toward Margo, retaining some semblance of tactical deployment north of the LZ, and risk the Arc Light. To those who have seen a proper Arc Light, the choice was easy. The companies were directed to hold in place and begin moving south to the LZ early the next morning. But as a concession to common sense, that portion of the order regarding the 61 grid line was interpreted rather loosely. WE WOULD DEFEND MARGO. The weather on 16 September matched the brilliance of the days gone by. Today, the Vietnamese Bureau of Tourism would be touting the weather, on that day in 1968, however, it turned into a scene from hell Occasionally stopping to engage the NVA units following them, the three rifle companies, slowly made their way back to Margo. Echo Company came in last. Commanded by Captain John Cregan, now a Roman Catholic priest, the company began the climb up Margo’s northern slope about and by 1430 or so was beginning to take up its assigned defensive positions on the northern perimeter. Even after ignoring the order to stay, south of the 61 grid line, there were too many troops in too small an area — and they had to contend with Margo’s hard ground. Digging in took more time. Early in the afternoon, there were ominous sightings of North Vietnamese Soldiers with mortars fording the Cam Lo River west of Margo. Artillery fire was called, probably without effect. At the same time, there was a minor flurry of activity as the BLT shifted to the operational control of the 9th Marines and radio frequencies were changed and tested. That done, the chatter of the troops and clanging of their entrenching tools were the only sounds disturbing the quiet. At 1500, Captain Ken Dewey, an F-4 pilot serving as the battalion’s air liaison officer, was looking north toward the left of the two hills that had been the original objectives when suddenly a mirror started flashing — followed immediately by the soft “thunking” sound of mortars firing in the distance. Within seconds, Margo was blanketed with exploding 82-mm rounds from several points on the compass, especially the northern arc. The battalion began – its “time on the cross” as the French put it in an earlier Indochina War. The noise was deafening. Each explosion filled the surrounding air with black, stinking, greasy tasting smoke. The mortar men poured it on until 200 to 300 rounds had pummeled the Marines and Corpsmen, a good percentage of whom had no protection beyond that of shallow fighting holes. As, the fire eased, the LZ sprang to life and First Lieutenant Al Green’s 81mm. 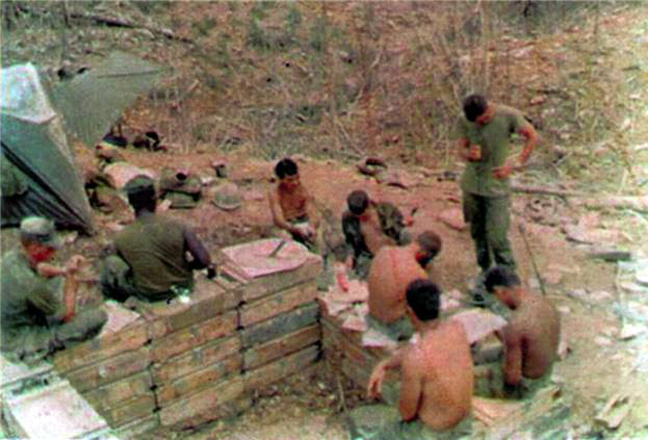 mortar platoon began counter battery fires, an action that won them concentrated NVA attention. 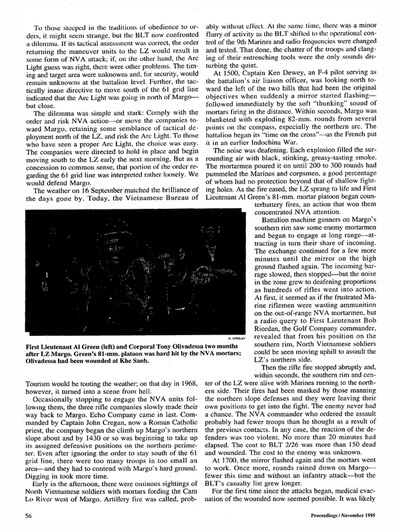 Battalion machine gunners on Margo’s southern rim saw some enemy mortar men and began to engage at long range attracting in turn their share of incoming. The exchange continued for a few more minutes until the mirror on the high ground flashed again. The incoming barrage slowed, then stopped— but the noise in the, zone grew to deafening proportions as hundreds of rifles went into action. 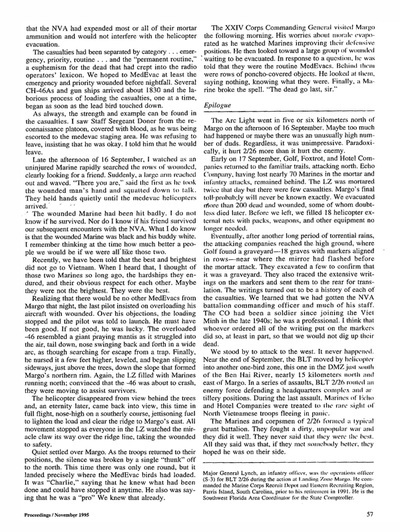 At first, it seemed as if the frustrated Marine riflemen were wasting ammunition on the out-of-range NVA mortar men, but a radio query to First Lieutenant Bob Riordan, the Golf Company commander, revealed that from his position, on the -southern rim, North Vietnamese soldiers could be seen moving uphill to assault the LZ’s northern side. Then the rifle fire stopped abruptly and, within seconds, the southern rim and center of the LZ were alive with Marines running to the northern side. Their fires had been masked by those manning the northern slope defenses and they were leaving their own positions to get into the fight. The enemy never had a chance, The NVA commander who ordered the assault, probably had fewer’ troops than he thought as a result of the previous contacts. In any case, the reaction of the defenders was too violent. No more than 20 minutes had elapsed. The cost to BLT 2/26 was more than 150 dead and wounded. The cost to the enemy was unknown. At 1700, the mirror flashed again and the mortars went, to work. Once more, rounds rained down on Margo fewer this time and without – an infantry attack – but the BLT’s casualty list grow longer. For the first time since the attacks began, medical evacuation of the wounded now seemed possible. It was likely that the NVA had expended most or all of their mortar ammunition and would not interfere with the helicopter evacuation. The casualties had been separated by category . . . emergency, priority, routine … and the “permanent routine,” a euphemism for the dead that had crept into the radio operator’s lexicon. We hoped to Medivac at least the emergency and priority wounded before nightfall. Several CH-46As and gun ships arrived about 1830 and the laborious process of loading the casualties, one at a time, began as soon as the lead bird touched down. As always, the strength and example can be found in the casualties. I saw Staff Sergeant Doner from the reconnaissance platoon, covered with ‘ with blood, as he was being escorted to the Medivac staging area. He was refusing to leave, insisting that he was okay. I told him that he would leave. Late the afternoon of 16 September, I watched as an uninjured Marine rapidly searched the rows of wounded, clearly looking for a friend. Suddenly, a large arm reached out and waved. “There you are,” said the first as he took the wounded man’s hand and squatted down to talk. They held hands quietly until the Medivac helicopters arrived. The wounded Marine had been hit badly, I do not know if he survived. Nor do I know if his friend survived our subsequent encounters with the NVA. What I do know is that the wounded Marine was black and his buddy white. I remember thinking at the time how much better a people we would be if we were all like those two. Recently, we have been told that the best and brightest did not go to Vietnam. When I heard that, I thought of those two Marines so long ago, the hardships they endured, and their obvious respect for each other. Maybe they were not the brightest. They were the best. Realizing that there would be no other Medivacs from Margo that night, the last pilot insisted on overloading his aircraft with wounded. Over his objections, the loading stopped and the pilot was told to launch. He must have been good. If not good, he was lucky. The overloaded 46 resembled a giant praying mantis as it struggled into the air, tail down, nose swinging back and forth in a wide arc, as though searching for escape from a trap. Finally, he nursed it a few feet higher, leveled, and began slipping sideways, just above the trees, down the slope that formed Margo’s northern rim. Again, the LZ filled with Marines running north: convinced that the -46 was about to crash, they were moving to assist survivors. The helicopter disappeared from view behind the trees and, an eternity later, came back into view, this time in full flight, nose high on a southerly course, jettisoning fuel to lighten the load and clear the ridge to Margo’s east. All movement stopped as everyone in the LZ watched the miracle claw its way over the ridge line, taking the wounded to safety. Quiet settled over Margo. As the troops returned to their positions, the silence was broken by a single “thunk” off to the north. This time there was only one round, but it landed precisely where the Medivac birds had loaded. It was “Charlie,” saying that he knew what had been done and could have stopped it anytime. He also was saying that he was a “pro” We knew that already. The Arc Light went in five or six kilometers north of Margo on the afternoon of 16 September. Maybe too much had happened or maybe there was an unusually high number of duds. Regardless, it was unimpressive. Paradoxically, it hurt 2/26 more than it hurt the enemy. ‘Early on 17 September, Golf, Foxtrot, and, Hotel Companies returned to the familiar trails, attacking north. 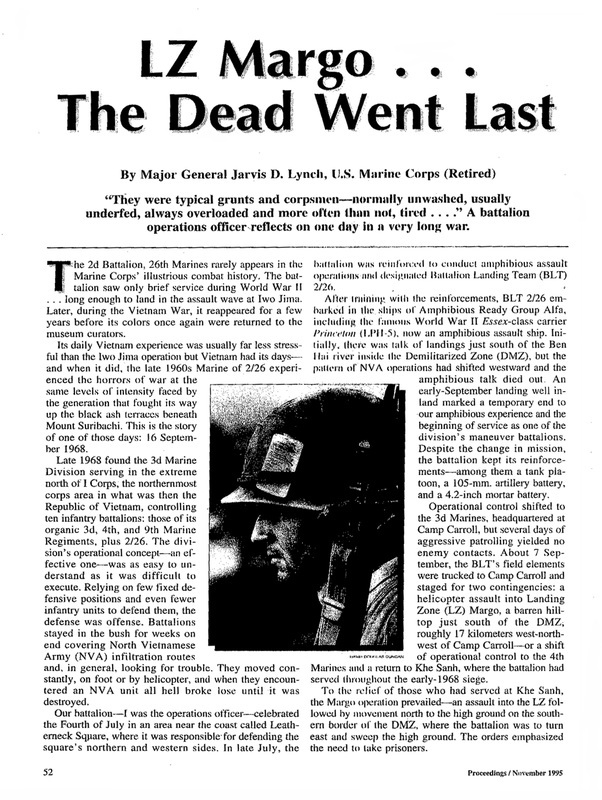 Echo Company, having lost nearly 70 Marines in the mortar and infantry attacks, remained behind. The LZ was mortared twice that day but there were few casualties. Margo’s final toll probably will never be known exactly. We evacuated more than 200 dead and wounded, some of whom doubtless died later. Before we left, we filled 18 helicopter external nets with packs, weapons, and other equipment, no longer needed. Eventually, after another long period of torrential rains, the attacking companies reached the high ground, where Golf found a graveyard — 18 graves with markers aligned in rows — near where the mirror had flashed before the mortar attack. They excavated a few to confirm that it was a graveyard. They also traced the extensive writings on the markers and sent them to the rear for translation. The writings turned out to be a history of each of the casualties. We learned that we had gotten the NVA battalion commanding officer and much of his staff. The CO had been a soldier since joining the Viet Minh in the late 1940s, he was a professional. I think that whoever ordered all of the writing put on the markers did so, at least in part, so that we would not dig up their dead. We stood by to attack to the west. It never happened. Near the end of September, the BLT moved by helicopter into another one-bird zone, his one in the DMZ just south of the Ben Hai River, nearly 15 kilometers north and east of Margo. In a series of assaults, BLT 2/26 routed an enemy force defending a headquarters complex and artillery positions. 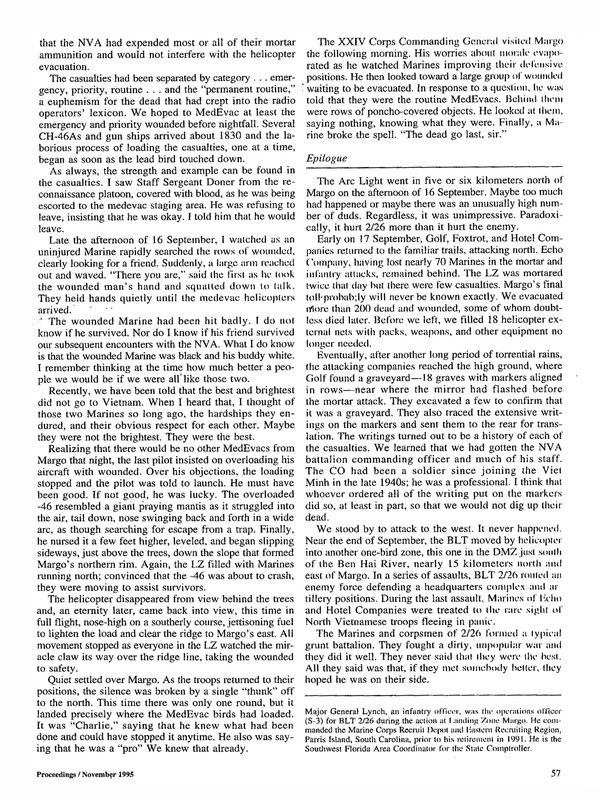 During the last assault, Marines of Echo and Hotel Companies were treated to the rare sight of North Vietnamese troops fleeing in panic. The Marines and Corpsmen of 2/26 formed a typical grunt battalion. They fought a dirty, unpopular war and they did it well. They never said that they were the best. All they said was that, if they met somebody better, they hoped he was on their side. Major General Lynch, an infantry officer, was the operations officer (S-3) for BLT 2/26 during the- action at Landing Zone Margo. 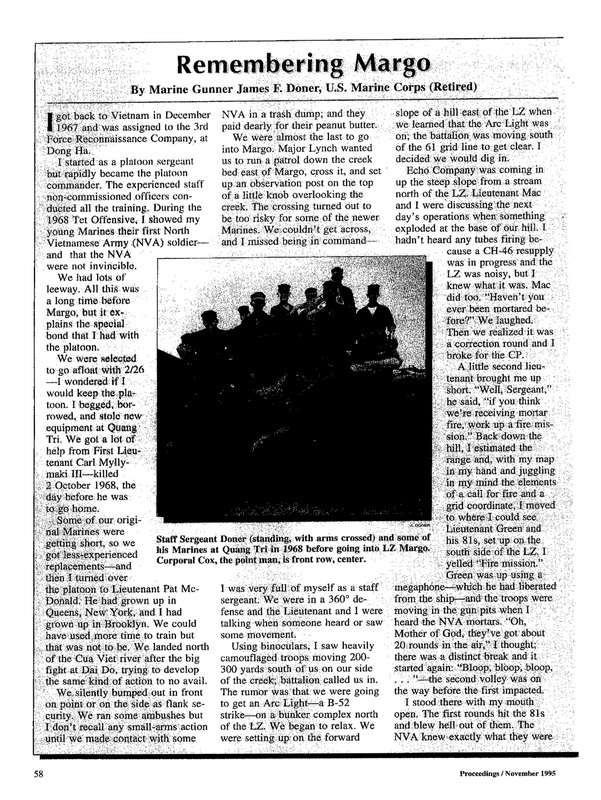 He commanded the Marine Corps Recruit Depot and Eastern Recruiting Region, Parris Island, South Carolina, prior to his retirement in 1991. He is the Southwest Florida Area Co-ordinator for the State Comptroller.